Tilt-in-space stainless steel shower commode chair for small adults and paediatrics. The RAZ Attendant Tilt Paediatric (ATP) shower chair is based on our popular RAZ AT chair, which for years has been a market leading design in tilting shower chair. 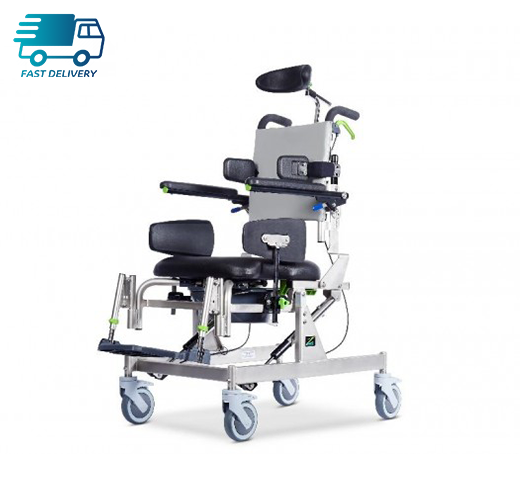 The ATP is multi-adjustable chair with a range of seat heights, seat depths, armrest heights and backrest angle adjustments as standard which allows movement within the frame to best suit the patient and the environment. The use of IPAS (Ischial pelvic alignment system), allows the aperture to be aligned with a user's pelvis and the contoured soft foam goes further in reducing pressure. The ATP features a hydraulically adjustable chassis achieving up to 40° tilt and with an upgrade. The AdjustaBack offers tension-adjustment in the backrest to provide postural support to spinal curvatures and can offer a degree of lateral support. There is a wide range of accessories available including a range of positioning aids like pelvic straps, ankle supports and chest harness.